An inflatable space tower tall enough launch spacecraft has been proposed by Brendan Quine, Raj Seth and George Zhu at York University in Toronto, Canada. If the tower is built on a suitable mountain peak it could reach an altitude of about 20 kilometers. 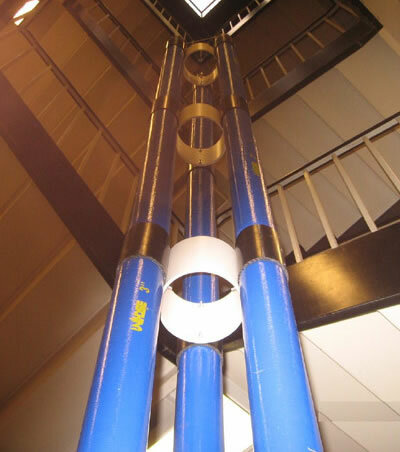 The team envisages assembling the structure from a series of modules constructed from Kevlar-polyethylene composite tubes made rigid by inflating them with a lightweight gas such as helium. To test the idea, they built a 7-meter scale model made up of six modules (see above image). Each module was built out of three laminated polyethylene tubes 8 centimeters in diameter, mounted around circular spacers and inflated with air. To stay upright and withstand winds, full-scale structures would require gyroscopes and active stabilization systems in each module. The team modeled a 15-kilometer tower made up of 100 modules, each one 150 meter tall and 230 metres in diameter, built from inflatable tubes 2 meters across. Quine estimates it would weigh about 800,000 tonnes when pressurized - around twice the weight of the world's largest supertanker. Fans of science fiction writer David Brin may recall the towering "Needles from his 1980 novel Sundiver. ...the few times he had left Earth before, rising and returning by balloon, there have been the other ships to watch, bright and busy as they floated up to Power Station or back down the pressurized interior of one of the Needles. Neither of the great Needles had ever been boring. The thin ceram walls that held the twenty-mile towers at sea-level pressures had been painted with gigantic murals -- huge swooping birds and pseudo science-fiction space battles copied from twenty-century magazines. It had never been claustrophobic. Via New Scientist; thanks to Erik Nodacker for submitting the story and the tip.